Demonstrate the how the aerobic energy system provides energy to fuel our muscles when we exercise. The aerobic oxidative energy system is a very important energy system in the human body, as it is the primary source of energy for a very broad range of activities. Daily activities such as walking, jogging, swimming, household chores, and walking up stairs all use energy provided by the aerobic oxidative system. During intense exercise, well trained individuals can elevate their rate of oxygen consumption up to 20 times above resting values. 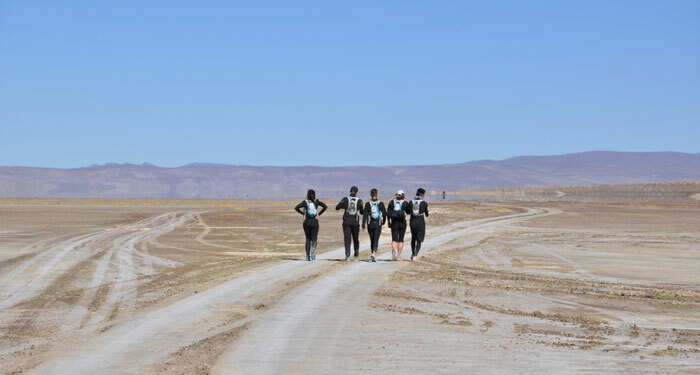 At elevation we expect to see a decrease in heart rate and improved metabolic efficiency as the runners adapt to the decreased atmospheric pressure on the Salar. Aerobic Metabolism: Heart Rate Participants will wear heart rate monitors during a running day. We can measure heart rate as they run across the distances. Comparisons can be made between runners. We can also do this on day 1 and day 7 and compare how much faster people run at the same HR or how much lower the HR is at the same running speed. Aerobic Metabolism: Caloric Expenditure Participants will wear heart rate monitors during a running day. We can measure calories they run across the distances. Comparisons can be made between runners. We will also determine changes in metabolic efficiency between days 1 and 7. Getting oxygen into the blood to fuel our muscles and brain at rest is complicated. Getting it in during running while at altitude is even more challenging. That's why our heart has to work extra hard while exercising at altitude - the blood carries less oxygen, so the gap has to be made up somehow. In response the heart beats faster. We've seen those results at rest. The heart contracts in a constant rhythm (the heart beat) that may speed up or slow down depending on the need for blood (and oxygen) in the various body tissues. For example, if you start running, your leg muscles will need more oxygen to do the work of running. Therefore your heart will have to pump more oxygen-carrying blood to those working muscles, and so have to beat more rapidly in order to supply that blood.In today's post we will show you how hard the heart is working during exercise. 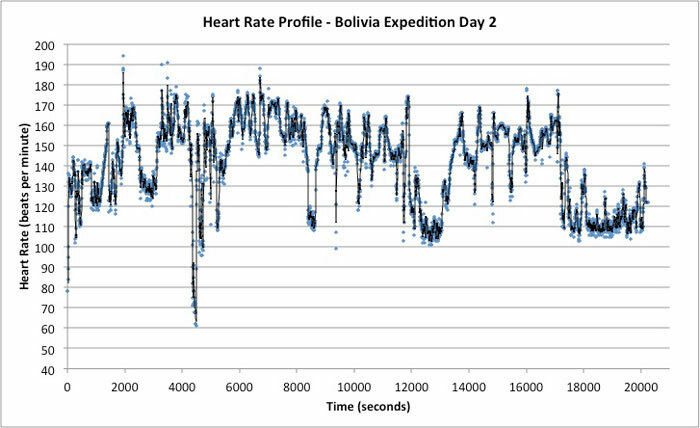 The low points in the heart rate graph are rest stations, and you can also see how the team has taken on the strategy of working in intervals. There are points when the heart rate is up, and when it comes back down as the Youth Ambassadors walk to recover. In today's video you can hear from Ryan and Brandon about how he felt during their run. There is also a terrific video of the finish where you can see the emotions of the Ambassadors as they cross the finish line at the end of the day. When you work hard and push your body to the limit (as you can see on the HR graphs) over a period of hours over extended distances the feeling of accomplishment can be overwhelming. Watching these Youth Ambassadors can be equally overwhelming. 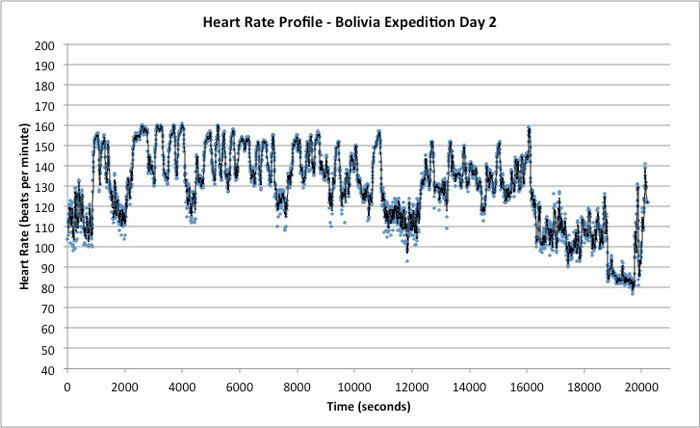 I hope that by seeing the physiologic data that you can appreciate what these incredible young people are trying to do here in Bolivia.